I actually found this in my local supermarket - it's a blend of Extra Virgin Avocado, Olive and Flaxseed oils. 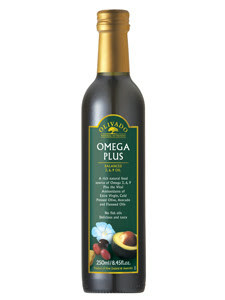 2 teaspoons per day of this delicious oil will give you the minimum daily requirements of Omega 3, 6, & 9 fatty acids, all in the correct balance in an easily digestible and metabolized form. Also contains Vitamin E, Chlorophyll, Lutein, and Beta Sitosterol. Flax seed oil breaks down under high heat, so be sure not to use this oil for cooking or sauteeing. It's best used as a condiment over steamed veggies, in a salad dressing, or you can add it to smoothies (if you're into that sort of thing! ).